filament: PLA, ABS, wood polymers, etc. 【1】 Super Large Print Size: 320mm×320mm×420mm, it enables you to print large-size 3D models. 【3】 Filament detector: The filament detector eliminates the pain caused by the breaking or breaking of the filament. The detection system will warn you to change the filament if the printer is running in the air or the coil is empty. This additional gadget would avoid printing without starting and improving print satisfaction. 【4】Silicon Carbide Glass Building platform: Silicon carbide glass with microporous coating as A30 building platform, without the need of attaching the masking tape. It is of good adhesion, freeing you from the headache of first layer warping. 【5】Break Resume :The restore pause function provides A30 to save the print status in real time and resume the print job exactly where it left off. This feature completely eliminates the hassle of repetitive and boring printing caused by a sudden power outage. Eliminate the hassle of printing large 3D models. 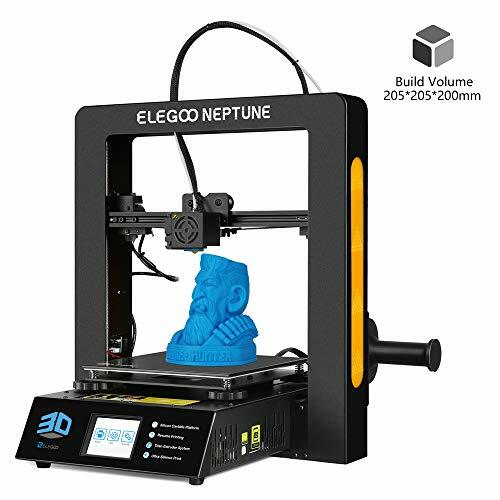 ELEGOO NEPTUNE is our very first FDM 3D printer which comes semi-assembled and 3 steps are all it takes to build up. NEPTUNE uses the full metal structure design and Mean Well Power Supply to ensure the solid machine quality and safe printing experience. Material Compatibility：PLA, ABS, HIPS, TPU, Wooden, etc. 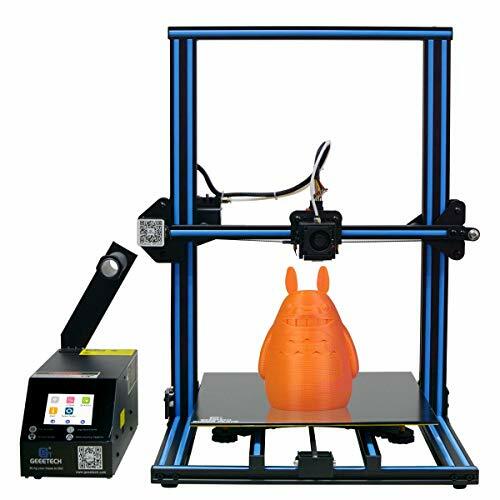 【Works Out of the Box】 3 steps to set up the whole printer with semi-assembly components and within 5 minutes you can start your first printing. 【Accurate and Stable Extrusion】Titan extruder offers precise ecxtrusion for your 3D printing with its solid filament drive and overall mechanical design. Compatible with most filaments like PLA, ABS, TPU, etc. 【Sillicon Carbide Platform】Carbide glass build platform with excellent adhesion and easy to remove model after printing. Durable quality for long term use. 【Safe and Secure】NEPTUNE uses MEAN WELL LRS-350 35W single output switching power supply, which has the complete protection functions and is complied with the international safety regulations giving you a worriless and safe printing experience. 【Filament Detection and Resume Printing】Comes with a filament detection switch, NEPTUNE can always find out the filament outage and pause the print allowing you to replace the filaments. Auto-resume feature will continue printing once the power is back on again just in case of power outage. 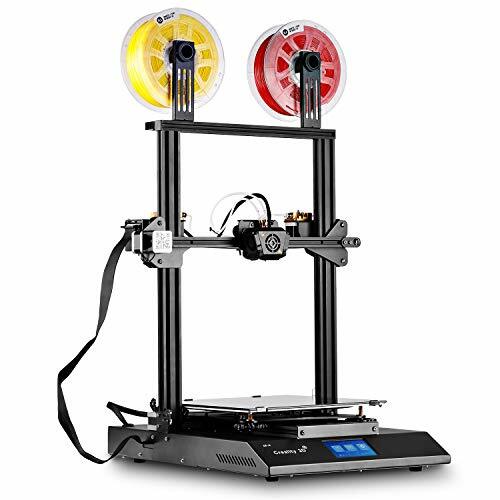 If you are an experienced 3D printing enthusiast looking for an upgrade, look no further. CR-X’s dual extrusion system gives you more printing capabilities than you will ever need. It also has a tempered glass heated bed with a nano-technology (Carboloy) print surface, which makes both adhesion and part removal easier for the user. This printer will meet all your 3D printing needs and beat all your expectations in every way. As an industry leader since 2010, SainSmart offers a 1-year manufacturer’s warranty on 3D printers, so you can rest assured that your purchase is protected. Contact us for professional solutions or recommendations and expect a qualified response within one business day. Buy with confidence! Integrated Design: The all-in-one base provides the frame for the CR-X while also housing the printer board and power supply for a compact and efficient printer! Dual Extruder: Single nozzle, Dual Extrusion. CR-X comes with a new print head design that channels two filament feeds through a single nozzle. A purge tower will be built to clear the residue in each extruder during filaments switching. Carboloy Silicon Printing Platform: The Carboloy silicone coated printing platform provides a strong first layer adhesion when temperatures in the print bed reach 60°C! Allowing for easier printing and removal! Stable Printing: The bottom slide block has 8 pulleys, and the bottom profile is relatively solid. This unique design allows the entire machine to run smoothly when printing. Three Fans Cooling: Better and faster cooling with more efficient radiating. Three fans to help cool the extruded filament and improve consistency in layering.